This would be my 3rd trip to Japan this year (2017). This time and May was based on the meetings. The 2nd trip in August was taking Jacob (my son) around Tokyo and Yokohama. The symbolism of 3 times in 1 year was to equate to 3-1, for the 31st year of the F31. Since this was a short trip as well (5 days) I had to plan it accordingly and of course, a few things didn’t go my way. I had residual goals I didn’t meet on the prior trips and I also discovered a few places I really wanted to check. This trip would have me go to Saitama twice to visit shops I wanted to last May. I would also make a trip to Enoshima Island with intentions of riding the Monorail there. Additional the experiences of Night train, Onsen and capsule hotel were high on my list. I would end the trip going to the meeting and heading to the Yokohama for one more night and then go to Haneda to fly back. Thursday – Matchless Crowd Racing, Tec Arts, and Saitama meeting. 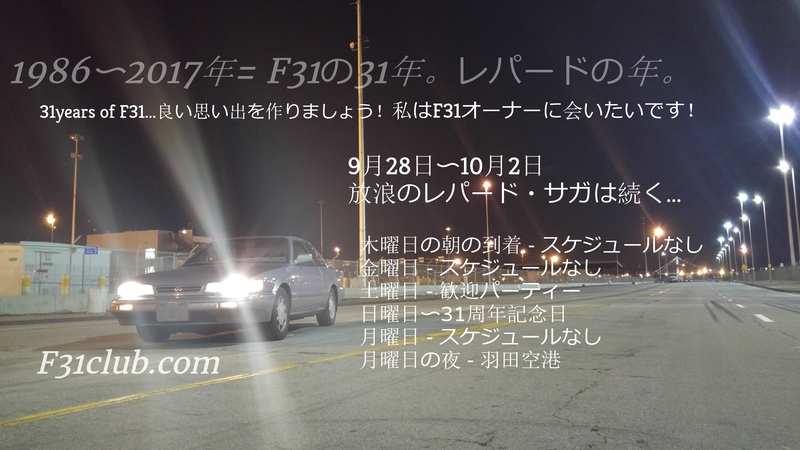 Friday – Mizuno Works, Art Planning Youma, Refresh 60, Enoshima Island meet, Original JDM guy Meet, Sunrise Express meet and train. This entry was posted in blog, events, history, Meetings, review and tagged wandering leopard saga. ← Write up – Custom Rear sunshade! For that Cali Sunshine!! !